Vytru's RVC - Room Video Conferencing System for Skype for Business (Microsoft Lync) gives you HD video and audio, effortless content sharing, white boarding, and great meeting room experience all enclosed in a small square 4"x4" Codec. RVC is the ultimate solution for room video conferencing and group collaboration based on Skype for Business. Control the Far Camera very easily from the UI or the remote Control. Great for Healthcare use cases. With "Contacts", you have access to the Lync contact list with your Contact Groups and Contacts for quick ad-hoc Lync calls. Start Calendar meetings instantly with one tap of the screen. RVC supports touch displays and interactive boards. Extremely Easy to Set Up. Just Plug and Play. ﻿✔ The RVC3000 Codec can be set up in less than 2 minutes. ✔ Once you unbox the RVC3000 Package, you will find the Codec and the needed cables and accessories. ✔ Plug in your USB Video Conference Camera, your USB Audio System, your TV display(s). Then connect your power, and network cables. ✔ Turn on the system and it will boot up the Vytru Splash screen and then take you to the Configuration page. ✔ The RVC system enables you to build and customize your Lync video conference system for your meeting room size and your needs. ✔ RVC integrates with any display, any Lync USB Video Conference Camera and any USB Audio System. ✔ Small Meeting Rooms: Connect the RVC Codec to a Single Screen with a Front of Room Camera, microphone, and speakers. ✔ Mid-size Meeting Rooms: Two screens are recommended with the RVC Codec, a Pan-tilt-zoom PTZ Camera, and audio system. ✔ Large Meeting Rooms: Three screens are best alongside with the RVC Codec, one or two PTZ Cameras, and audio system. ✔ RVC supports single display, dual displays, and triple displays setups to help you present the speaker, participants based on your needs. ✔ RVC system auto-detects screen size and number to adjust resolution and content accordingly. ✔ RVC system’s User Interface is designed to work with any touch display which makes easier interaction with the system's features and functions. ✔ RVC perfectly supports interactive boards so users can write and manipulate content by using touch gestures or simply by picking up a pen or eraser. ✔ RVC works with USB Video Conference Cameras which are a great choice for video conferencing due to a variety of camera options. ✔ Based on your conference room size, you can use a Front of Room camera for small rooms, PTZ or Panoramic Cameras for mid-size and large rooms. ✔ The RVC system supports 1080p Full HD video resolution for better full HD face-to-face video communications. ✔ With RVC you cannot only control your own conference camera, you can also control the far camera as well. ✔ The RVC system supports multiple video sources which means you can connect more than one camera and switch between them easily. ✔ Meet-now: Initiating a meeting has never been easier. With the “Meet Now” tile you can start a quick ad-hoc Lync call and invite more people to it. ✔ Contacts: On the start screen you can go to your Lync Contact List, where you will find your Group and Lync Contacts. ✔ Frequent Contacts: From the Start Screen, get quick access to the contacts you frequently communicate with on your Lync Room System. ✔ Rich Contact cards: Your contacts are represented in Contact Card with the contact's name, job title, presence, and image. ✔ Join from Any Device: Meeting participants can join from Lync on PC, laptop, mobile, tablet, or the web anytime, anywhere. 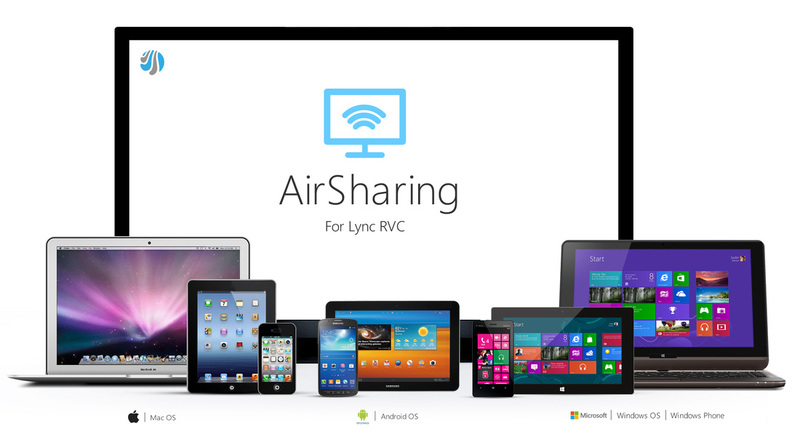 ✔ RVC uses the AirSharing technology to wirelessly share content from laptops, tablets, or smartphones to the RVC system. ✔ The shared content can be presented to in-room attendees on the display or shared with Lync Conference Call remote participants. ✔ There are no software add-on or client download needed on any laptop or mobile device to start wireless sharing using AirSharing technology. ✔ Anyone in the meeting room can share content freely in the meeting room with no need for HDMI cables. ✔ Native Exchange Integration: RVC is integrated with Microsoft exchange to auto-sync your Lync Meetings from the Outlook Calendar. ✔ One-touch Start Meetings: From the Start Screen, you will always see the Today View of the calendar. One tap or click will start the meeting instantly. ✔ Monthly Calendar View: RVC’s monthly calendar view enables you to view the scheduled Lync meetings for a given month or day. ✔ Non-Lync Meetings Support: The RVC Calendar also views the Calendar Appointments as well and can convert them to Lync meetings. ✔ Meeting Cards: The RVC Calendar introduces rich Meeting Card that show the meeting organizer and attendees name, title, presence, and image.